1994 was the 150th anniversary of the departure of the first emigrants from the Sognefjord area of Norway to America. In all, 30,000 people left Sogn, Norway, and it is estimated that about 350,000 descendants of these emigrants are in the USA. Descendants of these emigrants were invited to return to take part in a special Emigration Festival. They left Vik about 1859 and spent a few years in Bergen before leaving Norway on the ship BRODRENE on 25 April 1866 and arriving in Quebec, Canada, on 17 May 1866. [This was right after the end of the great American Civil War, but coming to America via Canada in the north spared the Stadem emigrants any contact with the war's turmoil and destruction, which surely scarred the southern portions of America for years to come. Many other emigrants in this period got involved in wartime because the country needed them. Before 1866 thousands stepped off boats and enlisted almost immediately, if they were able-bodied men, into battle to fight, and gave their lives to a country they had not yet possessed except as a dream and a hope. We salute all those brave Norwegians!--Ed.]. From there they traveled through the Great Lakes and overland to Iowa. We [Barbara and Vernon Benson] accepted the invitation to the Emigration Festival and spent three nights at the Hopstock Hotel in Vik i Sogn, Norway. The days were spent visiting the farms, churches, and areas where the ancestors had lived. The Vik commune is situated at the south side of the Sognefjord and is surrounded by high mountains. About 3000 people live in this area. Agriculture is the main livelihood of Vik, but there are some light industries. In 1991 Vik was voted the best place in Norway to live. Now, more about Vik, and Sjur and Oline, the grandparents of Alfred Stadem. Sjur Olsen was born on the Stadheim Farm. He was the son of Ole Person Stadheim and Brita Knudsdatter Djuvvik. His tombstone says he was born 17 December 1828. From that farm Sjur could see the town of Vik in the cove of the fjord. As we stood on the road in front of the Stadheim Farm we saw this view of Vik i Sogn on 24 June 1994. Sjur's wife Oline Madsdatter [According to the old Norwegian custom, the daughter was given a first-name and a second name that took the father's first name; thus: Oline, "datter" or daughter of Mads, the father; together, it comes out Oline Madsdatter. This perfectly logical and sensible custom went the same for the sons. Ole, son of Per, would be called Ole Person; the sons continued to be so named after coming to America, but the custom was dropped quite soon, and the last name was kept from son to son and then transferred to their descendants regardless of the individual fathers' first names. That is how even the daughters began to take the sons' name, so that they too became, in our example, Persons, or "sons of Per"--Ed.] was born in Vikoyri. Her parents were Mads Olsen Vikoren and Brita Jonsdatter Hove. Oline was born 27 December 1833. Vikoyri was a small settlement between the Vikja and Hopra rivers. The "Oyri" was created by sediment deposited from the rivers flowing across the mountains and valleys over thousands of years. Vikoyri was common land owned by the community. The poor people living there could make a living by working on neighboring farms, fishing in the fjord, or other trades. They had few possessions, but owned a small field around their home. We were not able to locate anyone that we are related to, but I am positive that we have some distant cousins in the area. Medieval Churches: There are two such in Vik i Sogn. The Hopperstad Stav Church ["hopper" meaning to to jump or leap, and so it might have meant "jumping place", perhaps a site of games or feats of strength in olden Viking times? Interesting to speculate!--Ed.] built around 1130 is situated on the west bank of the Hopra river. ["Stav" churches, of which there have survived only a few hunded in Norway, are multiple-gabled, high-roofed edifices built primarily of wood, often elaborately carved in the ornate Viking fashion, for some or all might have been pagan temples that the Vikings adapted to Christianity after they were converted. Stav Churches are Noway's priceless masterpieces of architecture and culture going back hundreds of years before Columbus, for Christianity has been in Norway at least a thousand years.--Ed.]. Mads Olsen Vikoren (who probably came from Forde) and Brita Jonsdatter Hove were married in the church on 10 November 1820. Their children were baptized there. Daughter Oline was baptized on 12 June 1835, and she was confirmed there on 7 April 1850. Through the years the church had been extended and reconstructed, but it has been restored to the original appearance. The baptismal font has been moved to the Vik Church where services are held today. We attended a Mid-Summer Eve Service in the church on 23 June 1994. The Hove Stone Church built about 1150 is on the other side of the river. Originally it was built as both a church and a castle. This church has also been restored and is used only for special occasions. Sjur Olsen Stadheim was baptized in the Hove Church 20 December 1829, and on 29 December 1857 Sjur Olsen Stadheim and Oline Madsdatter Vikoren were married in the Hove Church. The baptismal font was in the church, but we were not allowed to take pictures! [So, these records of baptisms, confirmations, and eventual marriages mark the tradition of the Stadheims; however poor they might be. However struggling to eke out an existence on the hard edge of semi-rural Norwegian society, on the marginal subsistence afforded on the alluvial "Oyri," they managed to establish their families and lives on the firm basis of faith in Christ. Their diligence and steadfastness as they cultivated faith in God, a responsibility and calling which they refused to shirk, stood them and their descendants in good stead for generations to come. We owe them now everything we take pride in possessing, for we are only building on what they established so long ago. "While visiting Vik i Sogn, Norway, in June 1994, we stopped at the Vik Lokalhistorisk Arkiv [Vik Local History Archive or Museum]. I was looking for information about Sjur/Syvert and Oline Stadem and their ancestors. Arne Inge Saebo, the director of the Center noticed that I had two old photographs with the other material. Immediately, he wanted to know who they were and if they were from Vik i Sogn. When Arne found out that they were Sjur and Oline Stadheim, he asked if I would send a copy of the pictures to have on file at the Vik Lokalhistoriske Arkiv. We met him again the following day at the Immigration Seminar, and he asked me to write an article about my great-grandparents. The article would be published in the PRIDLAO, which is printed here three times each year. "SJUR AND OLINE STADEM TO AMERICA"
On 25 April 1866 Sjur Olsen Stadheim, his wife Oline Madsdatter Vikoren, and their four young children (Berent Martin, Peder Johan, Ole Severin, and Bertine Gurine) left Bergen, Norway, on the ship, BRODENE [or BRODRENE--Editors], for the USA. Why Sjur and Oline left Norway is unknown. However, Sjur's older brother, Knud Olsen Stadheim, had sailed to America in 1854, and their mother Brita Knudsdatter Djuvvik Stadheim emigrated in 1856. These family members may have encouraged them to come to America. Knud married Agate Alvadatter Svolsvik on 25 September 1859 in Boone County, Illinois, and the family moved to Worth County, Iowa, about 1861. Agate was also born in Vik i Sogn. According to the National Census of 1865--Rode 22, No. 92 in the City of Bergen, Sjur who was a watchman lived with his wife Oline and their four children. Sjur and Oline had been living in Bergen for about six years. 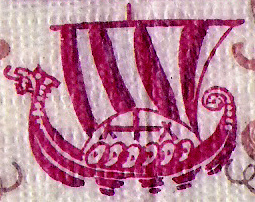 The three younger children had been baptized at Krosskirken in Bergen. However, Sjur and Oline were born in Vik i Sogn and lived there until after they were married. Sjur, the youngest son of Ole Person Stadheim and Brita Knudsdatter Djuvvik, was born on Stadheim Bruk n. 9. Sjur's grandparents Per Monsson Stadheim and Sigri Olsdatter, had purchased the farm in 1798 from Madam Daae. Sjur was baptized at the Hove Church on 20 December 1829, and he and Oline were married at that same church on 29 December 1857. Their first-born, Ole, died when he was a baby and was probably buried in Vik i Sogn. Oline, the daughter of Mads Olsen Vikoren and Brita Jonsdatter Hove, was born 27 December 1833, was baptized at the Hopperstad Church on 12 July 1835, and was confirmed in the Hopperstad church 7 July 1850. The voyage across the Atlantic took 32 days, arriving in Quebec, Canada, on 27 May 1866. From there they probably traveled through the Great Lakes to Chicago, Illinois, and then by land to Worth County, Iowa. They settled in Heartland Township where his brother Knud lived with his family. According to the US Census taken 20 July 1870, Farmer Sjur/Sever O. Stadem had real estate valued at $1600 and personal property worth $420. Martin, Peder, and Ole were attending school, but Tena, Christine, and Anna were at home. Two daughters, Martha and Anna Sophie were born after 1870, but the first Anna died in 1874. 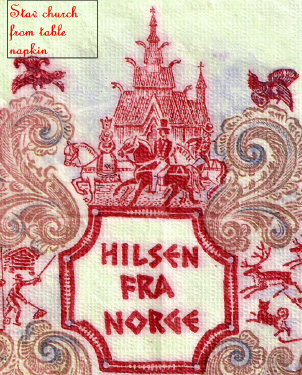 Their neighbors (others listed on the same census sheet) were also from Norway. The spelling of the family name was changed from Stadheim to Stadem. Sjur had many different spellings for his name on records in America: Sever, Syvert, or Sivert. In the spring of 1883, the Stadem family moved again, this time to homestead in Dakota Territory. Syvert and Oline built a house out of wood (which was very rare at this time) in what is now Washington Township, Clark County, South Dakota. This wooden house was destroyed by a cyclone [This event is described in detail by Alfred Stadem in "Papa's Story"--Ed.]. The land went to their son, Peder, and he built a sod shanty on this homestead land. Sjur and Oline moved in with their sons, Martin and Ole. These two brothers had homesteaded in what is now Dixon Township, Hamlin County, South Dakota. This farm was only about three miles from their first home. According to the 1900 Census, Syvert O. Stadem had become a citizen of the United States. He was able to speak some English although Oline could not. Neither of them could read or write English. Their grown children, Martin, Ole, and Anna, and a granddaughter Andrena Stene, were living with them. Six of their children married and made their homes close to their parents. and Anna Sophie married Erik Hanger of Trondheim, Norway. The Stadems were active in their church. They helped to start the Norwegian Evangelical Lutheran Church of Willow Lake, South Dakota. It was a rural church in Pleasant Township and in 1928 the name of the church was changed to Pleasant Lutheran Church. Syvert was on the committee to choose the site for the church and cemetery. Oline was a Charter Member of the Ladies Aid. The first wedding in the church was on 27 July 1884, when their son Peder married Marie Karlson. Their daughter Kristine was a member of the first confirmation class. Retired farmer Syvert O. Stadem died 17 May 1908 of broncho-pneumonia and was buried in the cemetery of Pleasant Lutheran Church of Willow Lake, South Dakota. Widow Oline Stadem who died on 30 April 1911 of apoplexy [her great-granddaughter Pearl Stadem Ginther passed on April 30, 2011, exactly 100 years later to the month and day!--Ed. ], her husband Syvert, and their son Ole, who died 20 September 1909 [just seven days after Pearl Stadem was born--Ed] are named on the same tombstone. Daughter Kristine Stadem Stene is buried in a nearby lot, as well as daughter Martha and her husband Andrew Vorseth. 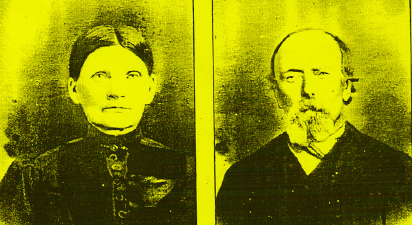 The descendants of these immigrants, Syvert and Oline, now number more than 600. The living descendants have moved to all areas of the United States [as well as foreign countries, Brazil and Columbia--Ed.] and are engaged in a variety of occupations. We do not all share the Stadem name, but we all share the Norwegian Heritage Syvert and Oline brought with them from Vik i Sogn to America!